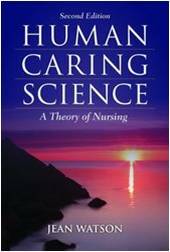 Human Caring Science: A Theory of Nursing, Second Edition by renowned nurse theorist Jean Watson discusses the balance between science and caring that forms the basis of the nursing profession. Watson's Theory of Human Care draws from Western and Eastern philosophers, approaching the human care relationship as a moral concept. Further, it seeks to elucidate the human care process in nursing, preserve humanity and the inner life of patients, and reintroduce true caring and healing into educational and clinical practices.